My wonderfully liberal little brother is having a rough week, so I thought I’d cheer him up in the best way I know how….by criticizing a Republican infographic. Now, I have no idea how much was given to Solyndra, or how many jobs wind energy has left, but I do know a thing or two about gas prices and infographic figures. I pulled out the ruler when I cropped the photo, and confirmed my suspicions. The larger pump in the picture doubles both the height and the width of the first pump. That’s not twice as big….that’s four times as big. I’m sure they’d defend it by pointing to the dashed lines in the background and saying only the height was supposed to be reflective, but it’s still deceptive. Curious what a gas pump actually twice as big would look like? Here you go….original low price on the left, original “double” price on the right, actual double in the middle. Graphics aside, let’s look at the numbers. That dip towards the end there with the arrow? That hit right as Obama was taking office. In July of 2008, gas was an average of $4.15 per gallon. By January of 2009, it was $1.84. I have not a clue why that drop happened, but I do know that to treat that $1.85 number as though it was standard at the time is a misrepresentation. Now, you could accurately say that George Bush took office with gas prices at $1.53 and left with them at $1.74….but clearly that would ignore a whole lot of data in between. Now, none of this adjusted for inflation. By adjusting the yearly averages to 2010 dollars, I got the second term of GWB to $2.99, and the current term for BHO to $3.00. You don’t have to like Barack Obama, and you certainly don’t have to like gas prices. No matter what your political affiliation, I think we can all agree on one thing: ALWAYS beware of infographics. Awe, and here I thought sewa was being sincere. And yes, ever since I read that book I have not been able to look at an infographic without thinking of that. Well, I figured that the data was chosen with a convenient minimum and a recent high. I hadn't considered the strange things that can be done with graphics. What I do know is that I have data on my own gas usage across the Obama and Bush administrations. By somewhat of an accident, the easiest data to access is the Obama timeframe. When I look at that data, I get a similar impression. 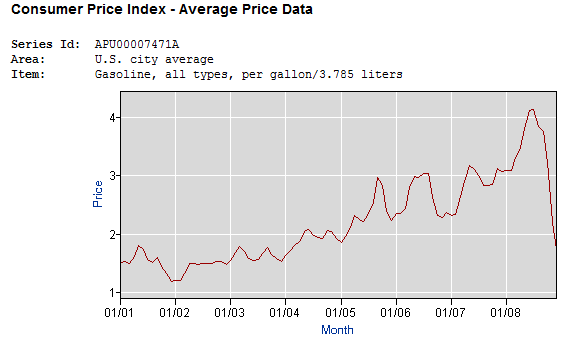 The cost-per-gallon did a deep dip in early 2009, but rose back to an average in the vicinity of $2.75/gal by summer 2009. 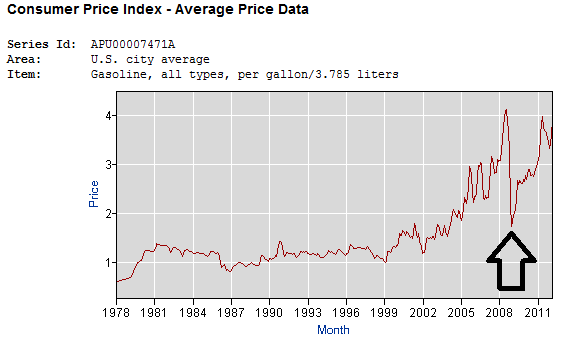 In early 2011, the price rose rapidly, and fluctuated between $3.25 and $4.00/gal since then. However, when I compare total cost to total gallons purchased, that value is still less than $3/gal. Thus, I'm still averaging $3/gal over the entire Obama Presidency. Things aren't considerably worse than during the second Bush term (though I think he was blamed for only one summer of $4/gal gas, and Obama looks like he might get blamed for a second summer of prices at that level).